We can't say enough about Ruth. I called Ruth in a panic two months before my wedding. She was gracious, commanding, diligent, creative, and supportive through the entire design process. Ruth and her team went above and beyond at the Burr Homestead. They turned a crabby white tent into a magical dream. Our guests are still talking about how beautiful the design was, and the amount of detail that was accounted for! Our day would not have been the same without you, Ruth! We have been using Ruth ridgeway and her wonderful company for the past 13 years. She did all 3 of our daughters Bat Mitzvah celebrations. As a Rabbi and Director of my school, Hebrew Wizards, she has helped me convert the First united Methodist Church into a beautiful synagogue for us to share our prayers during our High Holidays. ruth is a passionate signor and so easy to work with. She understands immediately what our goals will be, and her mission is aligned with ours, to make a beautiful celebration for our family and friends. Every event she puts her heart and soul into her work and the finishing product, is always excellent. Her staff is as amazing as she is. She is a one of a kind person with talent and compassion to make our visions come to life and be a memory forever in our hearts. From flowers, to decor, to planning and execution, there is no-one better than Ruth! Ruth has an amazing talent for party decor and flower arrangements. Ruth can transform any room into something very special. Our daughter Bat Mitzvah was beautiful and fun! Lots of compliments from guests. Every detail was taking care of. Ruth was very flexible and pleasant to work with! I can’t say enough good things about Ruth and her team. Ruth was an absolute pleasure to work with. She offers a unique blend of creativity and attention to detail but at the same time she is always mindful of the budget and always looking to give you the most impactful options. She is patient and rolls with the punches even when faced with last minute jitters or changes. She is professional but at the same time incredibly warm and approachable . If you are dreaming of an event that will wow your guests and exceed your highest expectorations, Ruth and her team are the ones you want on the job. Thank you Ruth! Ruth Ridgeway Designs is Amazing! Ruth Ridgeway and her team are incredible in every way. 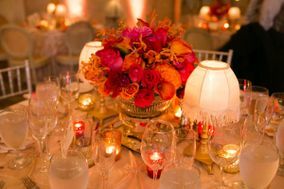 If you are looking for a wow to make your event special, you need Ruth Ridgeway Designs. They work with you to ensure everything is to your liking, fits your taste and personality and makes your event really special. Has an eye for detail and incredible vision! Couldn’t be happier -she made my wedding beautiful! Our daughter was married on July 28, 2018 at the Barns at Wesleyan Hills. Thanks to Ruth Ridgeway and her team of professionals the day was spectacular! Ruth not only is extremely talented, but her eye for detail is like no other. Her vision exceeded our expectations. The flowers were so beautiful, our guests were amazed by the quality of the work and how gorgeous everything looked. Just what the bride and groom had wanted. From the first time we met with Ruth, she was warm and wonderful to work with. We couldn't be happier. There wasn't a moment we had any concerns, because we new we had a pro at the helm. Ruth also has a wonderful staff that has been with her for years and are all also very talented and professional. Great job Ruth! I wish we could do it all over again! It was magnificant! I can’t even begin to describe how amazing Ruth Ridgeway Design is, I would give her 10 stars if I could. I have had a vision in my head of how my wedding would go, how it would look, the flowers, the décor, and everything in between. I could not have even dreamt up the amazing and beautiful day that she created for us. Ruth’s talent is unparalled. 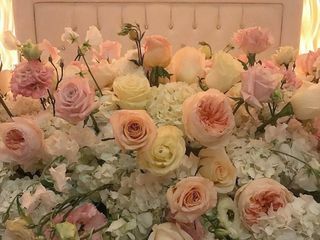 When we sat down to discuss the colors and the flowers and the overall feel, there was never an idea that I didn’t love. She truly listens to what you want and envision, and creates something that is just so far beyond your expectations. The flowers were so incredible, they were one of my absolute favorite parts of my entire wedding (second only to marrying my husband!). Thank you so much Ruth, you and your amazing team created a fairytale something that we will cherish for the rest of our lives!!! Chuppah ( wedding canopy ) we have ever seen! I actually remember holding my breath as I looked ahead and started the procession. The gorgeous Chuppah was handmade specially made for the bride and groom by a beloved aunt ,but what Ruth designed to compliment it was quite elegant and beautiful : incorporating the colors of the needlepoint while complimenting and enhancing the simplicity of this wonderful gift ~ it was flower magic! THE WHOLE ROOM WAS DIVINE! Every detail was perfection: the young friends of the couple especially enjoyed this little lounge area with couch and chairs for people to sit and visit - SO AWESOME! The icing on the cake was the " twinkle lights" that hung from the most gorgeous Magnolia tree right outside the tent as you approached. It was like nothing anyone has ever seen. You wanted to just be near it and basque in the romantic lights and aura she created for the evening. Ruth is a pleasure to work with and mother nature decided to give everyone involved a run for her money on the wedding day and all I saw was HER HUGE SMILE and joy on her face as she made it happen. She works beautifully with all vendors and is always accessible. I want to get remarried so I can have her design and decorate for me . IT WAS THE MOST ENCHANTING DAY EVER! Ruth surpassed all expectations and did an amazing job on the decor for my daughter’s Bat Mitzvah!!!! Such attention to detail, such creativity and great taste!!! Everyone was floored when they entered that ballroom! We couldn’t be happier! Thanks Ruth for helping make this an unforgettable celebration!!! Ruth's creative vision and attention to detail are extraordinary. This is clear from a review of her portfolio. But what sets Ruth apart and makes her work very special is that she is incredibly perceptive -- she "gets" her clients and she will not accept anything less than complete satisfaction. It's as important to Ruth to get it right as it will be to you (as the host of your event) or to your child (in the event of a Bar Mitzvah). Ruth anticipated what would be "cool" and "fun" to young people -- she knew it better than they knew it -- and was able to balance this requirement with my requirement that the decor be beautiful, elegant, and classic. I don't believe you will find someone more talented and dedicated to creating the right atmosphere for your celebration--regardless of whether the atmosphere is contemporary or traditional, glitzy or earthy, showy or understated. She will take her cue from you and she will deliver decor that helps you learn something about yourself. You'll walk into the room and recognize your own values and sense of beauty and you'll wonder how she managed to get it so right. Her intuition is invaluable, her professionalism is exceptional, her artwork extraordinary--she is a gem. Felt like I was in a fairytale at my own wedding!!! Ruth goes above and beyond! People couldn’t stop talking about how beautiful everything was thanks to Ruth!!! My daughter got married a month ago and one of the best decisions we made was hiring Ruth Ridgeway! I can't begin to tell you how many people told us it was the most beautiful wedding they had ever been to! Ruth created an elegant beach theme and followed it throughout the venue...from the flowers, to the lighting, and beyond...her work was breathtaking. Ruth was attentive to so many details which we never would have thought of but made all the difference...for example using silver chargers, the table linens, the use of high and low candles, the up lighting... these little things added up to make the wedding reception magical. 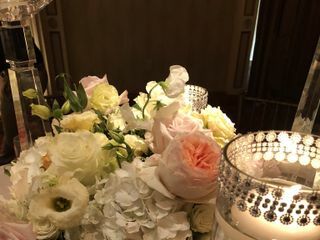 The way she used flowers and candles in the many centerpieces, and created a different design on every table at the reception was so impressive. Ruth was a pleasure to work with ...her vision and sense of style are unmatched! I would highly recommend working with Ruth...she made my daughter's wedding day one of the most beautiful and happiest days of her life! We hired Ruth for twice. Both events went beyond our expectations. Her attention to detail and her creativity are amazing! We have had many events over the years but none have ever come close to these last two done by her. She managed everything from start to finish. It's so nice to be able to be present and enjoy your own party. Ruth was able to do that for us. She is so kind and caring. Her enthusiasm is infectious. If you want to have the best event and enjoy the day, I suggest you hire Ruth. Words can't describe our sincere appreciation for the level of talent, creativity and professionalism Ruth R Design provided on our wedding day. 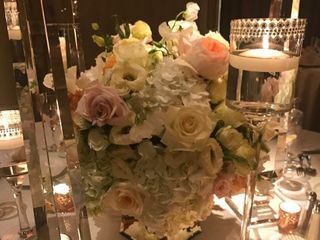 Our flower arrangements and table settings were EPIC! Our guests are still talking about how stunning our wedding was. Ruth R Design can make anything possible! We are forever grateful. Ruth Ridgeway brings to the table what you don't find from many other vendors: she can take your idea and translate it to the most magical thing possible--all while addressing your personal needs. Ruth will work alongside you every step of the way and collaborates very well with your other vendors. She is detailed oriented, technical, creative, forward thinking, innovative--all while keeping the focus on meeting your goals. You gain peace of mind knowing that things get done exceptionally well. She is an absolute pleasure to work with and second to none in creating the most beautiful and lasting memories for any event. The company I work at (can't say directly, but will say is a large and successful financial company located in Stamford, CT.) has used Ruth Ridgeway for about a decade now for all our onsite company events. She successfully executes by coming up with new and fresh ideas and creating inviting ambiance for our employees to socialize and unwind in. Her design detail is impeccable down to the tiniest of details as well as her knack of understanding her client’s taste. As for décor or theme, Ruth has a warehouse full of decorations to make any idea come to life. She’s tackled casual and relaxed all the way to chic and trendy for us and nails it every time. Her work ethic and get-it-done attitude have always made us feel more than comfortable that whatever she’s tasked with she’s going to get it done and with flying colors. Ruth is also just an amazing personality. She’s outgoing and energetic and makes event planning what it should be….fun! She takes the stress out of the process by making you feel you’re planning your event with a trusted friend. Someone who knows and understands your tastes and is equally invested in the outcome. On event days, you can plan on seeing her onsite touching up with last minute details and making sure you’re satisfied before she takes off. Some events we have her stay the entire time. She’s flexible when it comes to her client’s needs on party day. Book Ruth Ridgeway for you next company or personal event. You won’t be disappointed. Ruth has impecable taste and will make your event unique and memorable. I highly recommend her service to take the worry out of what is supposed to be a joyous occasion! Ruth knows how to make any celebration worth celebrating. She and her team were amazing! When we first met, we were thinking that my husband's 50th B day party would be primarily outside. She saw the space, listened to what we had to say and came up with the cost and her vision. Then, as we got closer to the event, we had to make a change and bring everything inside because the weather was not on our side. When we made that shift, she immediately understood and re- designed our whole event to be inside and transformed our house in such a way, that our friends are still talking about it. We had never thrown a party like that and had never used a designer, but I would do it again in a heart beat. The whole process was easy, professional and very organized. We highly recommend her for any event!! Where do I begin. When I started wedding planning, I didn't want to spend alot of money on our florals, thinking I would go with a local florist. As my ideas and vision for our "Winter Wonderland" wedding came together, I knew I needed more than just a local florist shop to help execute my vision. So I was given a couple references, one of which was Ruth Ridgeway Designs! I initially met with Ruth at Aria Banquet Facility (which was our venue), where we spoke about my vision and she gave me her input and some ideas of how we could make this come to life. I knew I was going to be in great hands and had great level of confidence in what she would bring to the table. I met and spoke with her one on one at all times. She was very straight forward when she gave me feedback as to her thoughts of detail and where my budget should be put to good use. Over the coming months, Ruth helped put together my vision for my cocktail hour, ceremony, reception, and lounge area by sending my photos and sketches. Aside from all that she did all my florals for the bridal party, myself, and some for the house the day of the wedding. To say our wedding was absolutely magical, is an understatement. Our guests were in awe, with the amount of detail and classiness! Nothing was too overdone or underdone. A perfect touch! During the wedding planning, I even asked if she would help out with my shower (which was a much smaller scale event than a wedding), since I was doing a 50s housewife themed shower. She agreed! When my guests walked into my shower, they felt like they were actually in the 50s era. My decor was outstanding! From the placecard table, to the linens, center pieces, room accents, it was phenomenal!!! I am so happy I went with Ruth and her team for both events, I would do it all over again if I could. If anyone is shopping around for a vendor that brings more than just florals to the table, Ruth Ridgeway Designs is the way to go!!! Perfection! Ruth designed my wedding, which took place at The Waterview in Monroe, CT. I could not have imagined anything more beautiful. 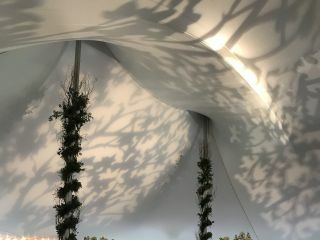 After having the opportunity to see many of Ruth's breathtaking events I knew that we would have a beautiful wedding, but Ruth and her exceptional team blew me away with the gorgeous design that they created for our winter wonderland wedding. Ruth took care of everything to make our ceremony decor/flowers, wedding party flowers, cocktail hour and reception decor/flowers elegant and unique. When you work with Ruth you are getting the opportunity to work with a professional who you can fully trust to make your vision come to life...and then some. Ruth has a keen ear to take in and capture every detail that you are wanting for your day while also using her expertise to make suggestions to enhance your event in every way possible. Ruth took our winter inspired wedding and brought it to a whole new level. I was unsure at first of exactly the type of flowers and decor I wanted for our wedding and after our initial design meeting, Ruth had taken the details that I shared with her and turned it into a winter wedding vision that I could have only dreamed of. Ruth is extremely kind, responsive, has a keen eye & the most creative mind that shines through in each of her events. Ruth gave my husband and I the most elegant and unique wedding that we were completely blown away by. Ruth showered our church with elegant flowers and gorgeous candelabras that lined the aisle making our ceremony absolutely stunning. Already impressed, I was blown away again by the cool, all white, lounge in our cocktail hour area, the exquisite white and silver reception flowers, lighting, candle light, and back drop details that she created. Ruth's creativity and attention to every beautiful detail make her a pleasure and SO much fun to work with. I would HIGHLY recommend working with Ruth and her team on any event. You will be absolutely thrilled! My daughter got married three weeks ago and it was the most beautiful, magical wedding you could ever imagine…thanks to Ruth Ridgeway Design. The phone still has not stopped ringing from different guests calling to tell me “that was the most beautiful wedding I’ve ever been to”, or “that wedding was out of a Storybook!" I was familiar with Ruth’s amazing work prior to my daughter’s wedding, but when I walked into the wedding venue and saw the room I was simply speechless. It was absolutely breathtaking! I honestly thought I was going to break down into tears. Ruth took our wedding flowers and decor to a whole new level. I could have never imagined the elegance and beauty which Ruth created. Ruth does not miss a beat and goes above and beyond your every expectation. 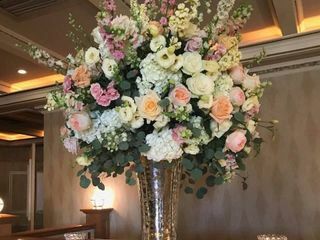 After my daughter and I first met with Ruth to go over the wedding flowers and decor we knew that we were not going to have to worry about a thing! We walked to our car like two little kids SO EXCITED about the wedding and all that Ruth and her staff were going to create for us! Ruth is so professional and she listens and guides you in every detail. Ruth’s vision and style took our wedding to a whole new level. It was just spectacular! When your daughter gets married you want everything to be so special and perfect for her…and Ruth did exactly that! Ruth is truly hands on and accessible to every detail. She turned my daughter’s wedding into a STUNNING, ELEGANT, MAGICAL storybook wedding. I cannot thank Ruth enough for all she did for my daughter and my family. I am still overjoyed every time I think of the wedding and all that Ruth created. I would HIGHLY, HIGHLY recommend Ruth and her professional team for any upcoming event you have without a doubt! !